For the series of photographs Signs that say what you want them to say and not signs that say what someone else wants you to say, made in 1992-3, Wearing asked people to write a sign that said something they really wanted to say and hold it up for the camera. 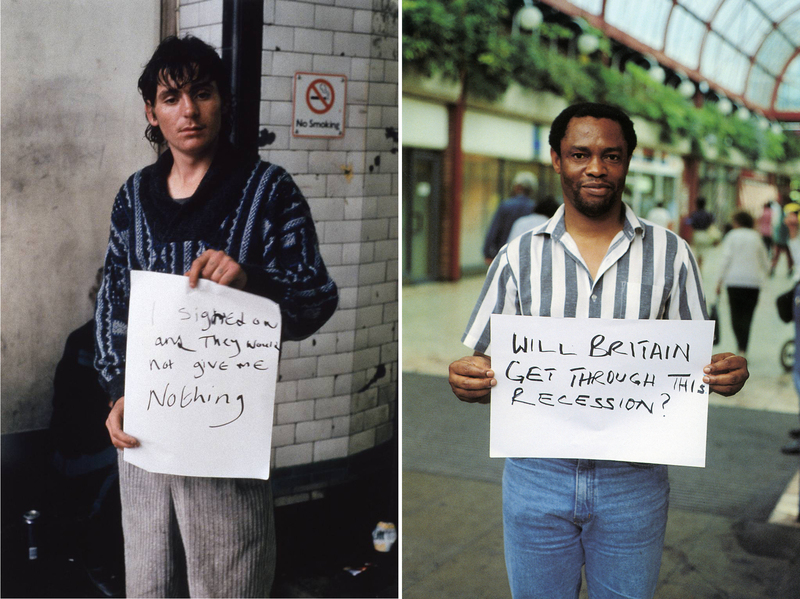 Some of the signs comment on the wider political situation of the time – like now, Britain was in a recession – others expose the anxieties of those who made them, with the subjects’ inner thoughts often jarring with their images. In works such as this, Wearing’s exploration of our day to day lives is fascinating. It is the very ordinariness of the subject matter that makes the work so compelling. The subjects of the pictures are ordinary Londoners, chosen not because they look different in some way but precisely because they don’t. Wearing has effectively approached a fairly random cross-section of society allowing people to share their concerns and innermost thoughts in an artwork. Though the subjects of the photographs aren’t in diguise, in many cases it’s clear that there is a difference between public face and private thought. In effect we all, to a greater or lesser extent, mask ourselves to face the world. Going a step further, Wearing advertised in Time Out – London’s listings magazine – for people to confess on video. 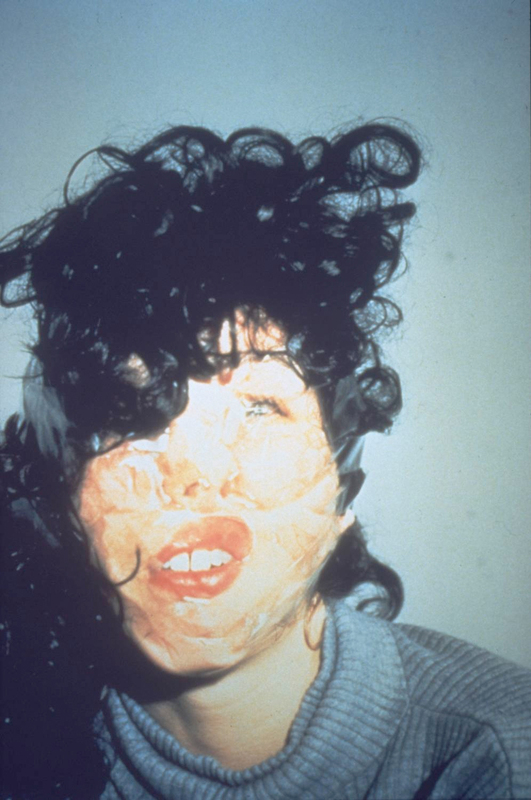 The advert – which became the title of the work – read: Confess all on video. Don’t worry, you will be in disguise. Intrigued? Call Gillian with a phone number. Those who responded were allowed free rein to reveal things they would never ordinarily tell anyone. Of course, the nature of work such as this is that not only are extraordinary truths revealed but also that lies may be told and we have no real way of telling fact from fiction. Works such as this – and it is territory Wearing returned to in Trauma (2000) and Secrets and Lies (2009) – can be hard to watch; some of the stories are unbearably sad. There is, though, inevitably a fascination about the lives of others. Those making confessions are masked to disguise their identity but it’s clear that in many cases these are people whose public face is also a mask, hiding the pain of private trauma or a second, secret, identity. The masks are often comical, again making for interesting juxtapositions between the image on screen and the words being spoken. It’s hard not to get side-tracked by watching what little can be seen of the real eyes and mouths behind the masks, but it is the stories that dominate. Objectively, we know that there is pain in the world. We read about it in the papers and watch it on the news. Here though, the people we sit next to on the bus or walk past in the street are revealing things about themselves that we would never guess. Suddenly the lives of others become a less abstract quantity. 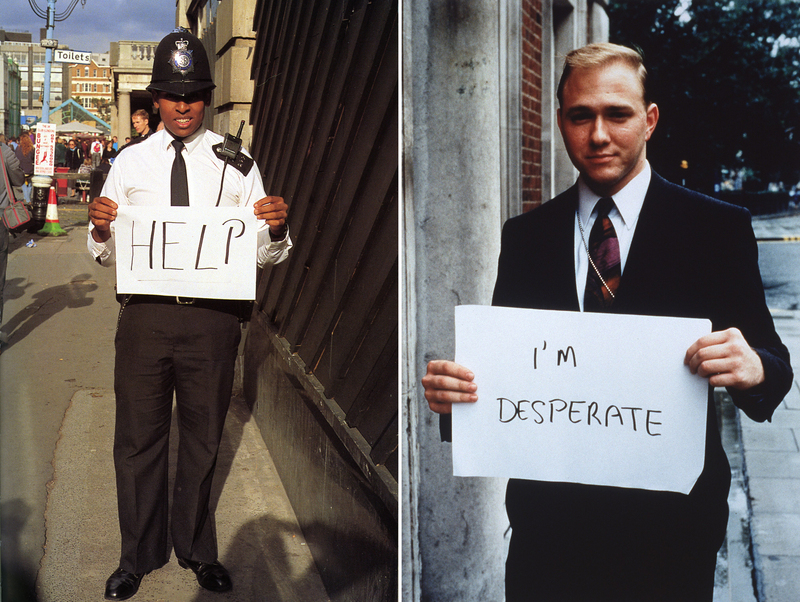 Gillian Wearing is at the Whitechapel Gallery until 17 June 2012. This entry was posted in Film/Video, Identity, Photography and tagged art, Confess all on video. Don’t worry, confession, Gillian Wearing, photography, Secrets and Lies, Signs that say what you want them to say and not signs that say what someone else wants you to say, Trauma, video, you will be in disguise. Intrigued? Call Gillian… by Ann Jones. Bookmark the permalink. It’s true; in some ways you’d hope some of Wearing’s work would look more dated by now rather than reminding us that things can get worse as well as better. I love the signs. I realized that, when I was reading them, I heard my own voice saying the words. I trust me, and I’m more likely to listen. So I got the message better from a sign, than from hearing those people tell me the same thing. If the people in the photographs were talking, I would be judging them – even if only in small ways – for their mannerisms, their speech, etc. That’s an interesting thought. With the video works, although we are listening to people telling their own stories, the masks provide a similar remove so maybe with those we’re also helped by not having the full picture and being able to pay attention to the words rather than forming a judgment about the person.